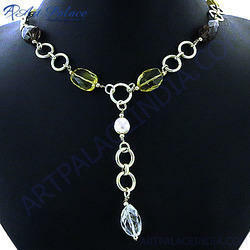 We offer a range of antique Italian Necklace Jewelry made from quality and pure gold and natural stones. These pure gold necklace and earrings are designed keeping track of latest trends and fashion to suit all sorts, but the ethnicity of old Mughal era is also highlighted to give that royal look. With the help of our creative designers, we are able to offer our clients with an enticing array of Beaded Stone Necklaces. 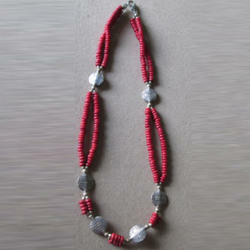 These necklaces are widely appreciated for their distinct finishing and appearance. Beautiful 3 line Necklace set with Cholocate colour Pearls are distinctly feminie and the perfect accessory for today's woman. CARE: Keep away from moisture/perfumes. Store in a tear & seal pouch which will be provided by us.